Okay, I’ve been putting this off long enough. The original reason for not posting March’s numbers was because Henrik was born on the 31st. When I finally had the time to sit down and put the numbers together, I was so horrified and ashamed of my findings that I just didn’t want to post them sooooooo…I didn’t. But here they are now — better late than never. Add it all together and you get $4468.66. The top two expenses are what killed me. It didn’t take long for me to learn first hand that Land Rovers are, um, incident-prone. The dashboard lit up like a Christmas tree mid-month and it cost me over a grand to fix it. 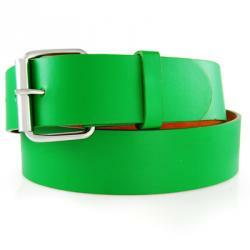 Something about a green serpent belt (pictured above) and a thermo-something. I don’t know… Take my money and make my car go. Thanks. Obviously, I’m not a gear head. Okay, okay… Their mission these days to collect money for premature babies or something, and that’s great and all, but this “donation” was really a hockey jersey purchase that I had no business making. For charity or not, it was still an ill-advised purchase. The rest of it is pretty self explanatory. The Credit Card transaction fee was for the convenience check I wrote to myself to pay for the Land Rover back in February. The cool t-shirt is, well, totally cool. 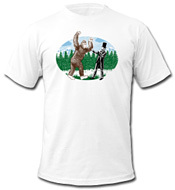 It has Abraham Lincoln fighting Big Foot on it and it’s awesome. I’ve gotten a great reception from the folks in Toddler Room 3 while wearing it. I found it interesting that we’ve been with MagicJack for an entire year now. I have to say that it’s been one of the best purchases I’ve ever made. We’ve saved so much money and haven’t noticed a difference in service from when we were with AT&T (and paying over $70 per month). If you’re on the fence about MagicJack, well, get off the fence. It works and it will save you a ton of money. Oh, and telemarketers will never find your number either. And I don’t really want to talk about it cause it makes me angry but, as expected, Bank of America dinged me with that $3.00 fee again. $1600 for hockey jerseys? Really?! & where is your car repair fund to pull from rather than writing a cc check for it? I think now is the time to start paying a set amount on to that CC you are caring. Budget it and do it! Also, plan for these extra emergencies a bit more. You CAN do it, you just have to decide to do it NOW! Thankfully, I did have a car repair fund (still do!) and the repair was paid in full the day I picked the car up. The nasty CC transaction fee was from the actual car purchase — that was something that I wasn’t really saving up for. We knew we’d need a new car this year — we just bought it 6 months earlier than I’d expected to. Gotchya on the cc fee. & you KNOW it’s $1600 on hockey jerseys, mister.